We’ll stop right there. Do you really need any more convincing? The fact of the matter is America is going mobile, and fast. Additionally, mobile marketing has proven to be far more effective than traditional methods. Now we’ll take a look and see why small businesses, in particular, have a lot to gain from mobile websites. Yet, despite these facts, 61% of small businesses are not taking advantage of mobile websites. This means that 61% of small businesses are making a big mistake. You don’t want to include yourself within this group. Small Business Mobile Websites – A Realistic Goal? Absolutely. You may be used to doing the majority of your own marketing work but you can take it easy in this case. 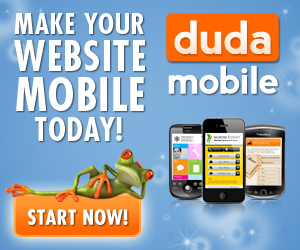 With the help of the mobile web professionals at Dudamobile, your small business can get a mobile website up in running quickly, easily, and at a price you can afford. Dudamobile has multiple plans and price options to fit any budget. There’s really nothing to think about. In case you’re the stubborn type and need more proof, here’s one last parting stat: 25% of smartphone users who searched a small business and found a mobile site made a purchase. Sign Up Now for our Free Mobile Marketing Training!